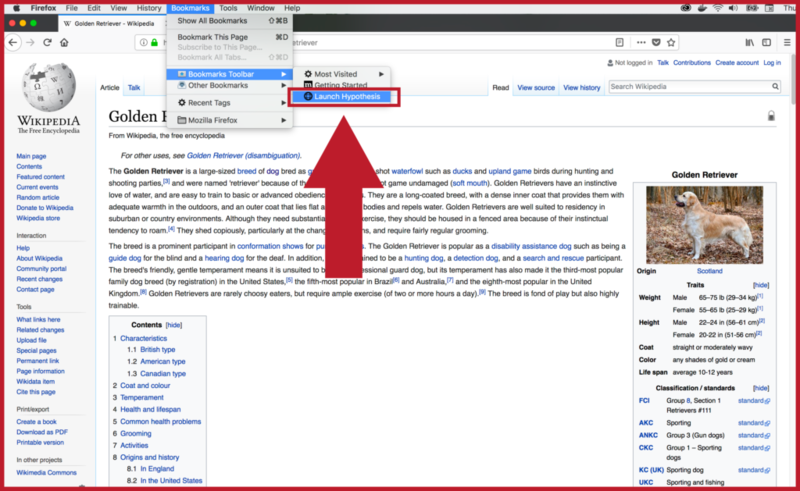 Once you have created your account and added Hypothesis to your browser, you will need to activate Hypothesis on each page you wish to annotate. Then, you will be able to select text on the page and add annotations, or expand the annotation pane and see annotations that have already been added. Navigate to the page you wish to annotate. Click on the greyed-out Hypothesis button in your browser’s toolbar. The button will turn a darker grey, and the annotation pane will appear on the page. Navigate to the page you wish to annotate. Open your Bookmarks and select the “Launch Hypothesis” bookmark. The annotation pane will appear on the page.